July 25, 2015 was the most magical day of my life. 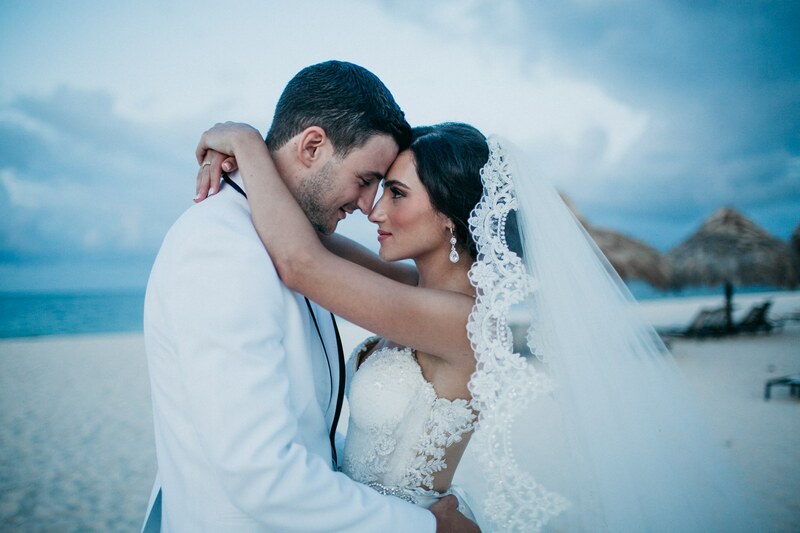 It was the day I married my better half in Punta Cana, Dominican Republic. Jason and I first vacationed in Punta Cana, as that is where we fell in love. 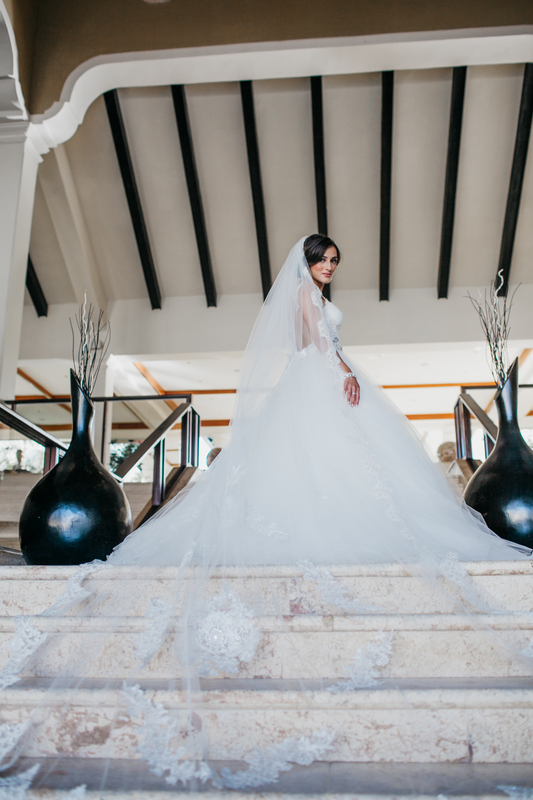 That is why we chose to have our destination wedding at Paradisus Palma Real Golf Resort and Spa in Punta Cana. We did extensive research before selecting our resort. 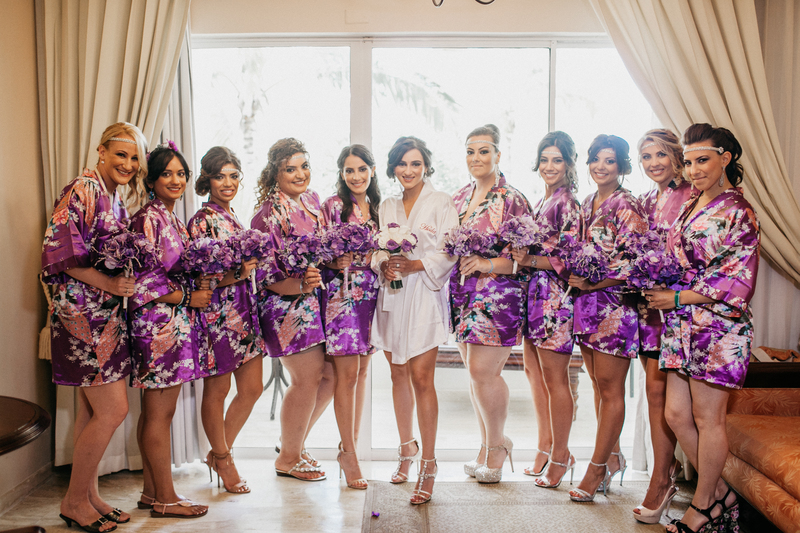 Paradisus Palma Real Golf Resort and Spa was voted as one of the top 10 resorts for destinations weddings in the Caribbean (The Bachelorette was filmed there). We took a “Love at First Site” visit in July 2014 to meet with all of the wedding vendors and check out the resort. 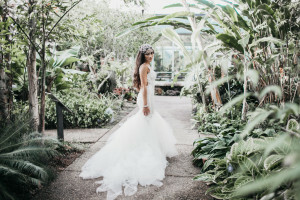 With a gorgeous garden gazebo that allowed me to rock my heels during the ceremony (#shortergirlproblems) and a beautiful ballroom on the premises, we knew it was the perfect place to make our dream wedding a reality! Although stressful at times, I really did enjoy the wedding planning process! 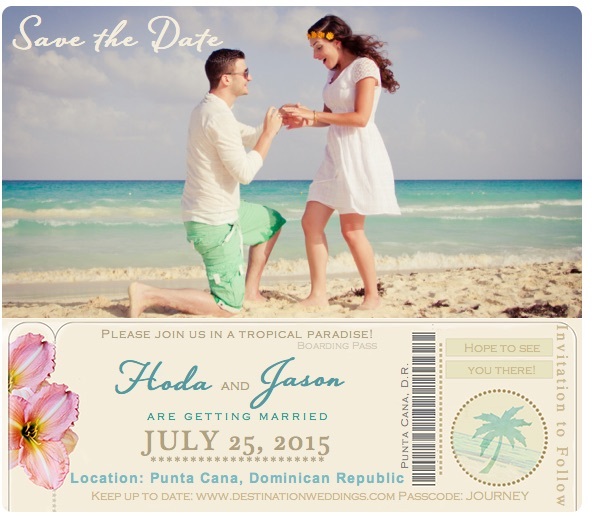 It all started with our boarding pass themed save the date magnets! 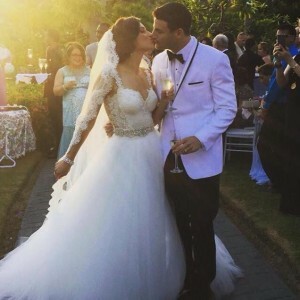 Check out some images below to see a glimpse of our big day! We had a Welcome Beach Barbecue on Thursday, July 23rd to greet all of our guests when they arrived and to get the party started! I wore a lace bodysuit and chiffon overlay skirt that I had designed on Etsy, topped with a floral headpiece made by my dear family friend, Marina. I always pictured myself in a tumpet style wedding dress that’s fitted throughout the bodice and extremely dramatic on the bottom. My MOH (my sister, Eman) and MOB (my mom, Nabiha) came with me wedding dress shopping. My sister was living in New York at the time, so we made a trip to all the major bridal salons, including Kleinfeld, where the TLC series “Say Yes to the Dress” is filmed. 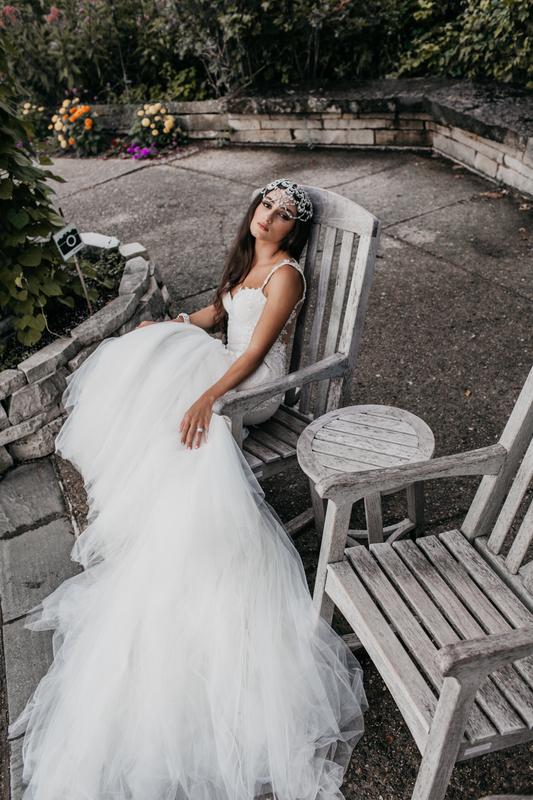 I found the Galia Lahav dress I loved at a posh boutique in the Big Apple but I knew that Roma Sposa in Birmingham, Michigan carried that designer and being the devout Detroiter that I am, I had to support my local businesses. Although I found my dress, it wasn’t the ballgown style that my mother always pictured her little girl in. So, I ended up wearing a detachable Monique Lhuillier skirt with a crystal belt for the ceremony, and I am so glad I did. 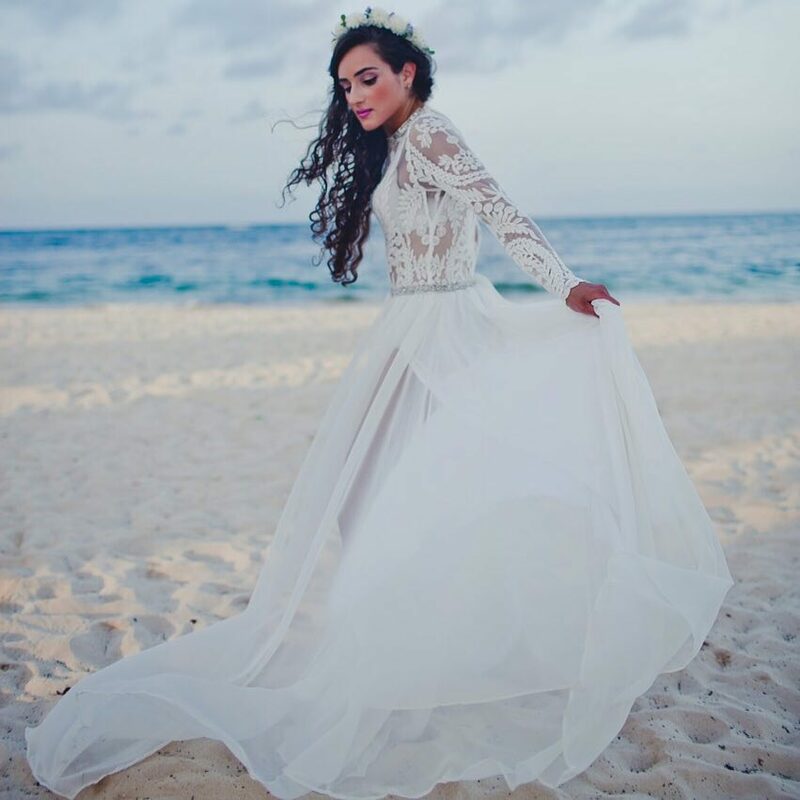 When else in my life would I have the opportunity to wear such a pronounced ballgown skirt? My veil that I wore during the ceremony was also by Galia Lahav. 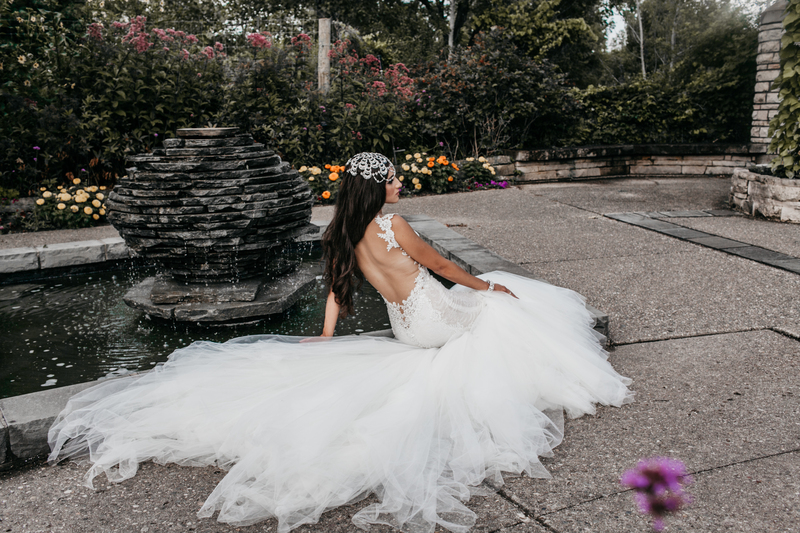 I removed the ballgown skirt to reveal my full Galia Lahav dress and swapped my veil with with a bold crystal headpiece by Maria Elena for the reception. 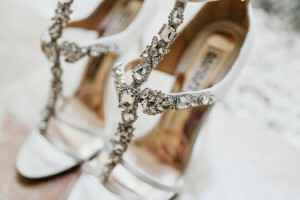 My shoes were by Badgley Mischka from Nordstrom. Our colors were shades of purple with a silver lining. 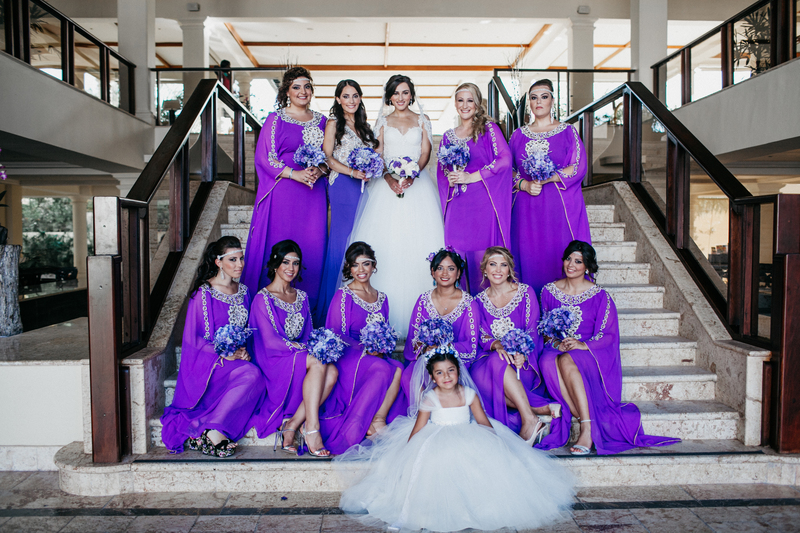 I wanted to incorporate some of my Middle Eastern roots with my bridesmaids dresses, so we modernized traditional caftans/farashas by shortening the slips and adding slits so you could see some more leg. 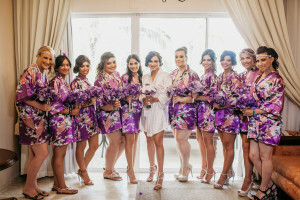 I gifted the ladies handmade crystal headpieces along with purple floral robes to wear while getting ready, both from Etsy. 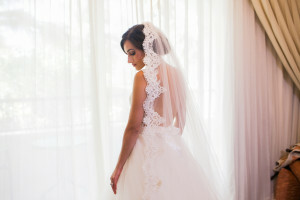 My MOH wore a gorgeous fitted dress with crystal detailing throughout the upper bodice with an open back and extended train. My flower girl/mini bride wore a darling dress and belt from Lace Bridal Boutique in Troy, Michigan, along with the veil that her mother (my cousin) wore to her wedding! I love that her dress coordinated with my outfit for the ceremony. My husband wore an Ike Behar tuxedo topped with a white dinner coat with black lapel detailing, black bowtie, retro black and white dress shoes, and Superman cuff links. 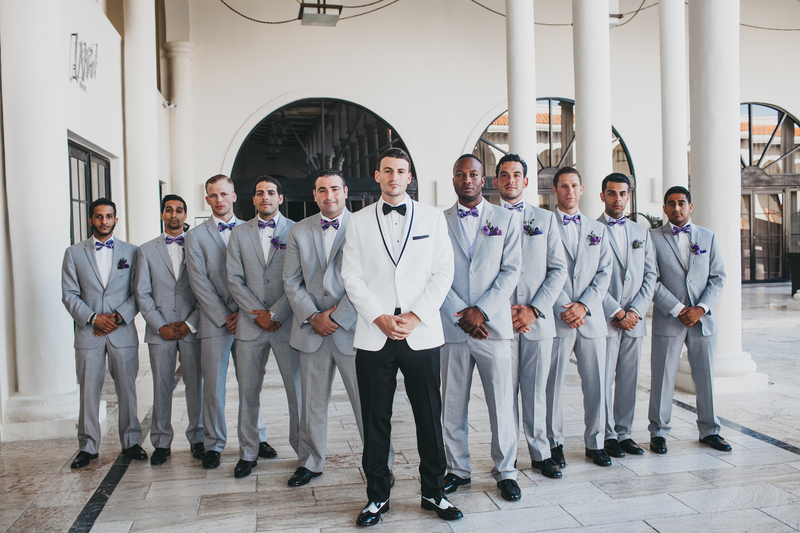 The groomsmen wore Joseph Abboud grey suits with suspenders and pops of purple with their bowties, pocket squares and socks. 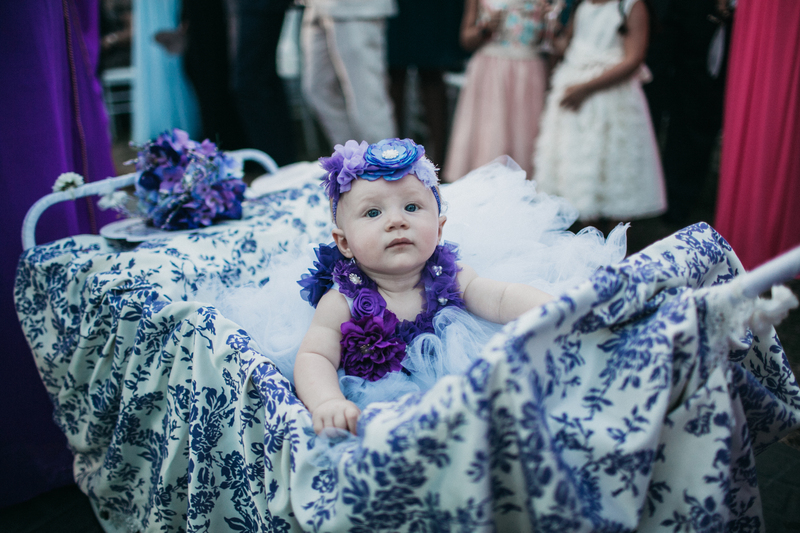 Our niece, Harmony, was nine months old at the time and we wanted to include her in our bridal party. We decided to spruce up a travel wagon by making a beautiful blanket cover adorned with lace and purple flowers to match with her custom designed outfit from Etsy. The big day wouldn’t have been complete without my go-to dream team. Our photographer, Jessica Kobeissi, is also from Detroit. She photographed our engagement photos that we featured in our magazine invite, and we couldn’t imagine anyone else capturing our wedding photography. She is extremely talented and has a great eye for photography. I let her know that I didn’t want cheesy wedding photos. 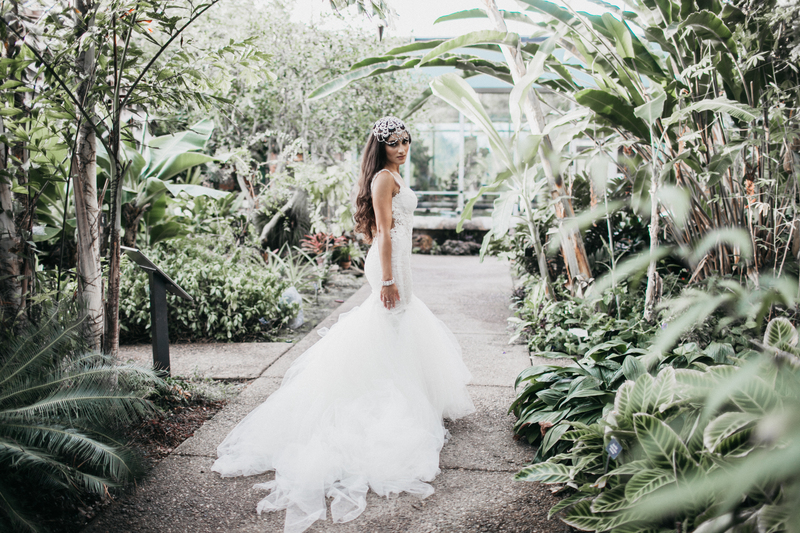 I wanted the images to be very editorial, and she exceeded my expectations. 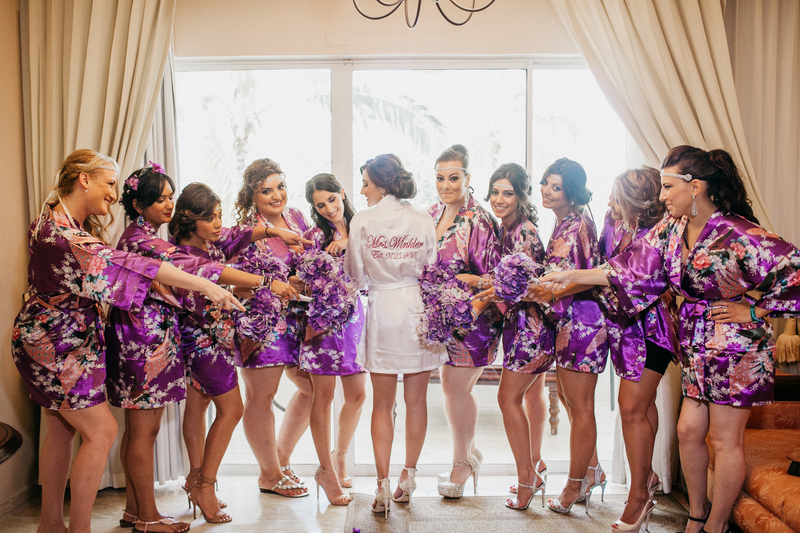 My hairstylist and makeup artist, Katrina Malota of Luigi Bruni Salon in Michigan, along with her assistant Lauren Russo, worked their magic on my large bridal party and me. The fact that my hair and makeup held up in that Dominican humidity proves that they are miracle workers. 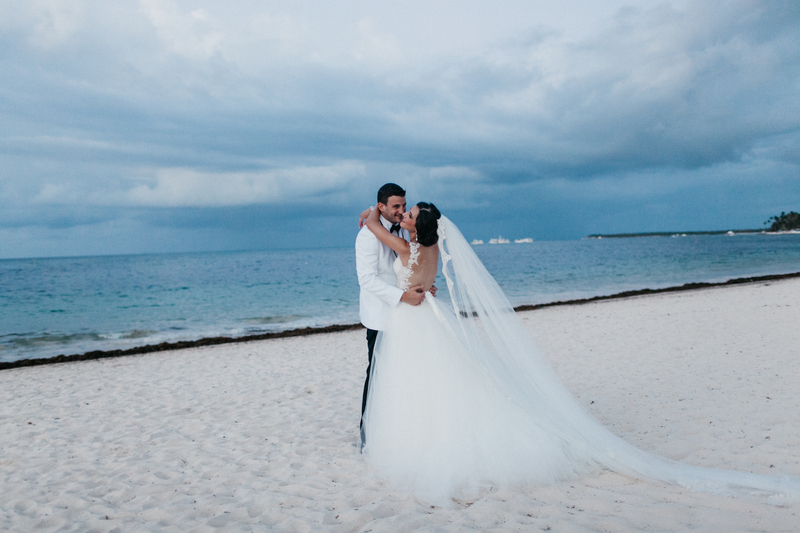 One hundred of our loved ones made the trip all the way to Punta Cana to see us tie the knot. To say that we are blessed is an understatement. 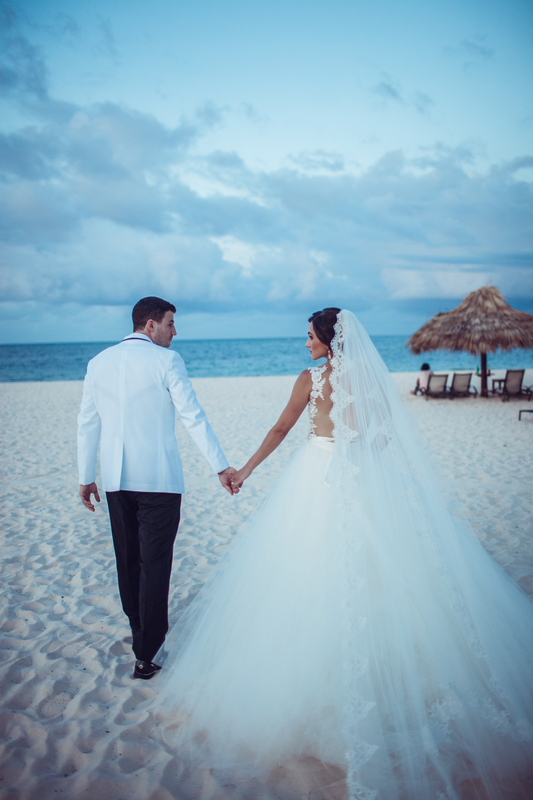 We highly recommend the resort to those planning a destination wedding or just a great vacation spot for some R & R!